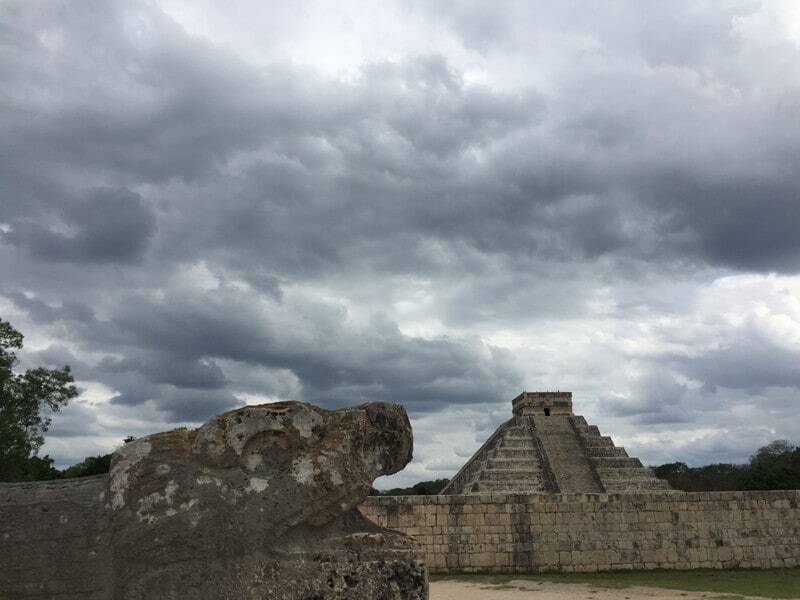 We are trying to fit in just a few more field trips before Nanna returns to the Great White North (Alaska) so yesterday we took off for Chichen Itza. The girls and Aunt Kim and I had already experienced one field trip to a ruins when we went to Coba but you really can’t get enough of this stuff (well, Zoe thinks you can!). Chichen Itza is about 2 hours away from Cancun. There are two routes to take, one toll road and one non-toll road. We opted for the toll road which was not so cheap (about US $12) but it was a lovely road with almost no one else on it. I told the girls they had to stay off their phones as we were travelling in new territory and I wanted them to see the sights. But mile after mile of nothing but bushy trees on either side of the highway soon caused me to relinquish my control and allow them to sleep or zone out on electronics. We decided to stop in the town of Vellolidad for lunch. We drove past a hotel and restaurant as we entered the town but we thought for sure there would be quaint options on the town square. 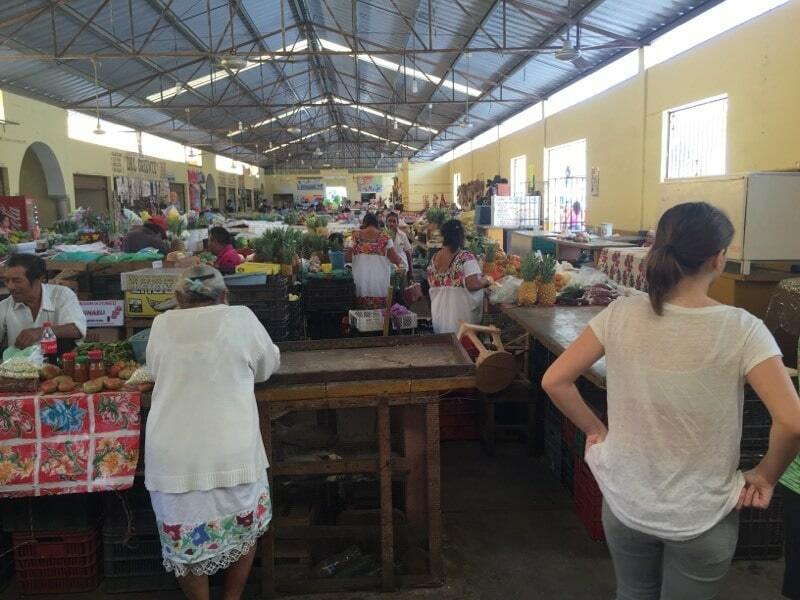 We did come across a town market place. We wandered around a bit but they didn’t have the kind of food we were looking for. And when we reached the section where they were butchering and selling meat all in the same place, Haley was chicken and had to duck out (#freepuns). She’s almost a vegetarian anyway, so there’s no need to speed up the process of eliminating major sources of protein from her diet. VLM: Very Large Market. I guess it’s there daily. We didn’t quite find a quaint little cafe that I had pictured in my head so we prepared to leave town and on the way out we realized that we had already seen the best option as we entered town. So we stopped there and had a lovely lunch. 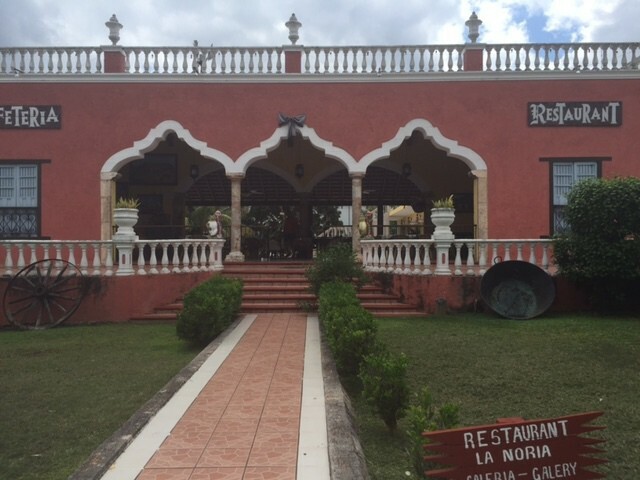 We were the only customers so we got great service and took advantage of the beautiful bathrooms before heading on down the road to Chichen Itza (or, as the girls’ Spanish teacher likes to call it: Chicken Pizza). This is where we had lunch. Lovely restaurant with great bathrooms! We were admiring the pine tree that seemed to be permanently crooked from the wind. We got to the ruins and we parked very close to the entrance for US $2. (Traveller Tip: For those planning a trip here, don’t buy tickets or tours or anything as you cross into the state of Yucatan at the border crossing. They’ll try to get you to buy there. Wait until you get to the ruins. And don’t park outside the gates of the ruins either. Plenty of people will be trying to get you to do that. Just keep going to the ruins.) Turns out most people come by bus so arriving by car is a piece of cake for parking. It looked like a used car lot for tour busses because of how many of them were parked there. And we found out that on Sundays, Mexican nationals get in for free so it’s very crowded. We were there on a Monday. Es bueno! So off we go to buy our tickets, with many offers to buy hats and sunscreen and bug spray and bags from lovely but overly friendly vendors on the steps of the entry way. They were shouting “only $1! 100 pesos!”. Well, 100 pesos is $5.64 so let’s just disregard all common sense for the sake of brevity, shall we! We got a big laugh out of that one. That was our math AND life lesson for the day. There is NO shortage of guides milling about the ticket counter. We hired a private one (US $50 incl tip) because I love guides and off we went. 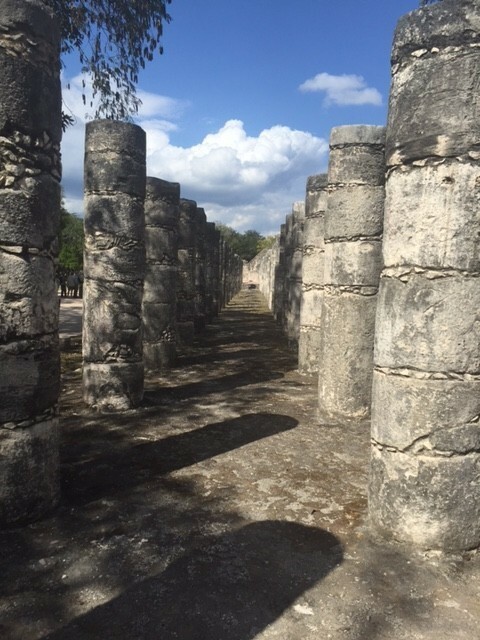 Unlike Coba, Chichen Itza has no “Mayan Taxis” (bicycles that you can sit in and be driven around) and the place is HUGE. 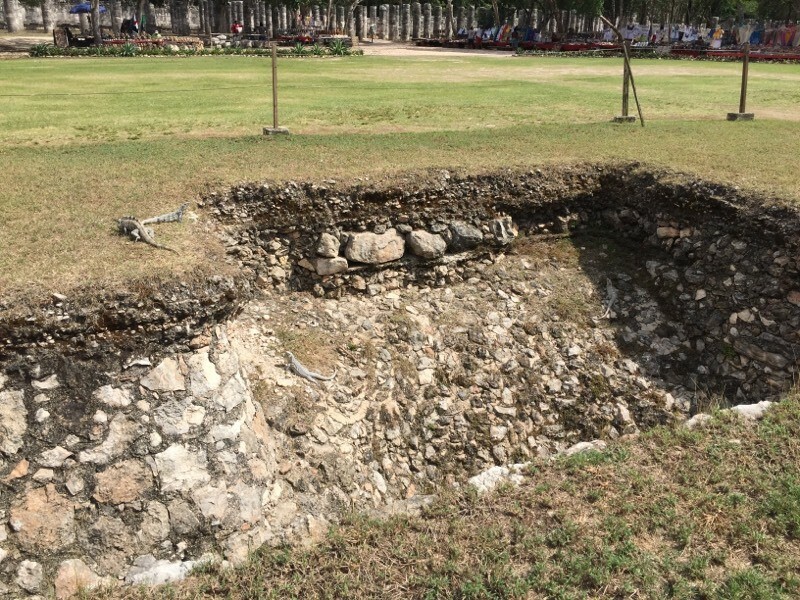 Turns out it’s 30 square miles and only 8% of it is excavated. EIGHT PERCENT!!!! But what we saw was really amazing. 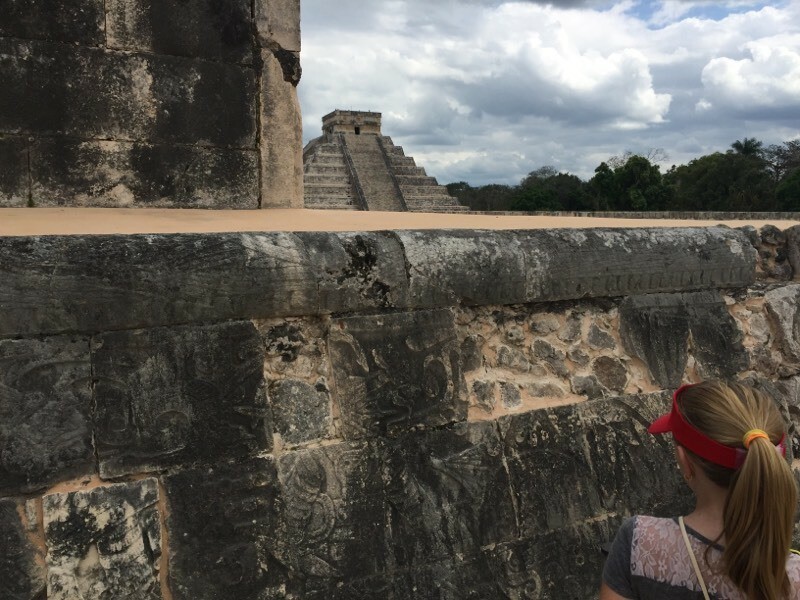 Haley was really really interested in everything and the more we heard about the Mayans and their math, acoustic and astronomy skills the more she perked up. She had an entire Mayan Civilization unit in 6th grade when she went to school in Arizona but she was never that interested until now. The power of Worldschooling, in action! Our guide, Luis, was of Mayan descent and he liked to show off his facial features that were prototypical Mayan. We wondered if that was really true but indeed he didn’t look as much like the Mexican people we know so we kind of had to believe him. His last name was the same as the name of one of the Mayan ruins, too. We had no way to verify that either so again we believed him. He was very knowledgeable and we spent about 2 hours learning about the Mayans and the structures they built and all their many advancements. Those Mayans were freakishly smart. All the correlations between celestial math and the math that went into building their structures is quite frankly spooky-smart. Like, shake-your-head-in-wonder, smart. It left a lot of questions unanswered, about how they knew to draw stuff that hadn’t happened at the time the edifices were constructed. Definitely makes you want to learn more (well, again, not Zoe). 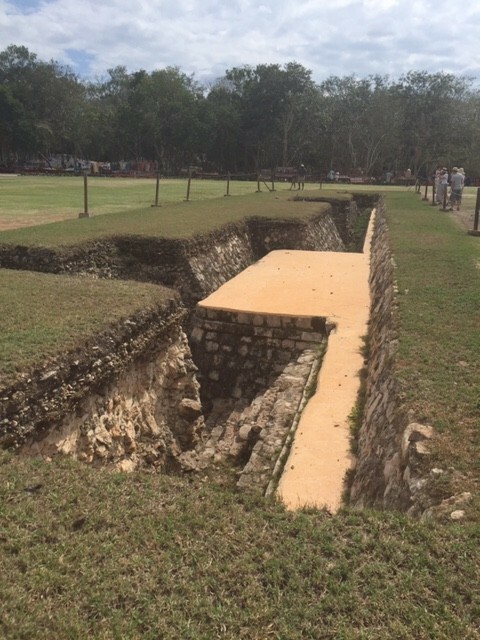 One of my favorite parts was seeing a partially excavated section. You could see a hole and then some ruins that were right below the surface level. I think Haley was ready to take a shovel to our backyard after seeing this. The iguanas liked this section too. Luis called them “Mayan Chicken”. We laughed. He asked if we had ever tasted iguana and we said no and he said “Are you suuuuure? Have you ever had chicken tacos?”. Yeah, okay. Haley is now a vegetarian. This is only about a foot below the current surface. More of the partially-excavated section. Note the large iguanas. These pillars represented fallen warriors evidently. They were in a perfectly straight line. They had excavated about 600 of them but they estimate there are thousands. Zoe studying some drawings on the side of the ball pit. 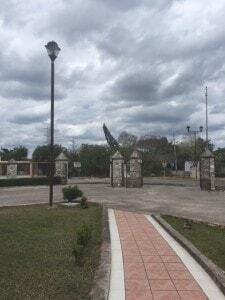 El Castillo is huge. Don’t get me started on all the crazy ways it was mathematically symbolic. It’s mind boggling. And if you clap at the bottom anywhere in front of the edifice, an echo comes back that sounds like a bird that existed on the Yucatan at the time of the Mayans. It is AMAZING! So after our tour we wandered around a bit more, got some refreshments and I bought the girls a few books in the bookstore. Zoe’s interest was piqued at the Mayan calendar and me, being a time and date kind of gal, agreed with her. Haley bought a book on Mayan legends and myths and Zoe and I agreed to share the calendar book. I was reminded of a cross country trip my father took me on when I was 11 where we had an unlimited budget for books. We can’t quite allow that with our one-suitcase policy, but our Amazon Kindle budget is equally unlimited. Now that we’ve been to 2 different Mayan ruins it’s hard to know which one we like better. 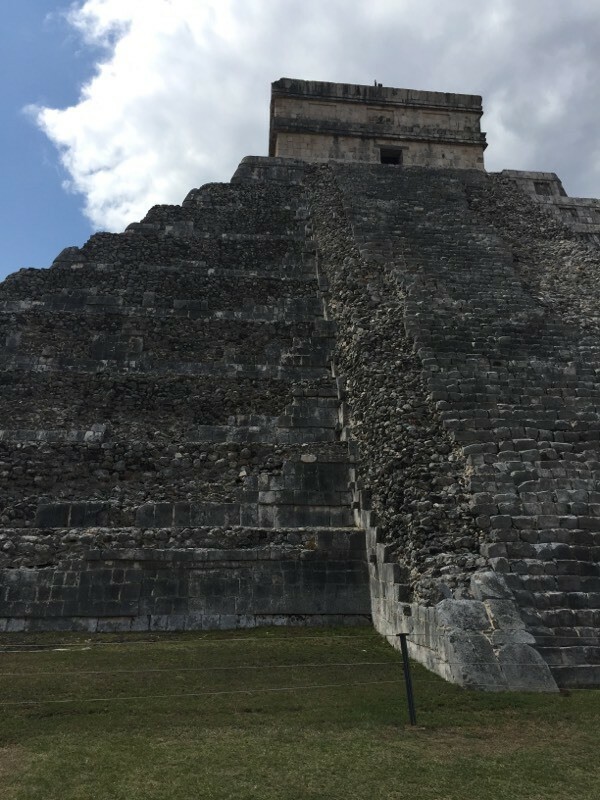 Coba was more interactive because we got to climb the “pyramid” and we felt like we could explore a little better in the Mayan Taxi, but Chichen Itza has the “WOW” factor and is much more excavated, even at only 8%. 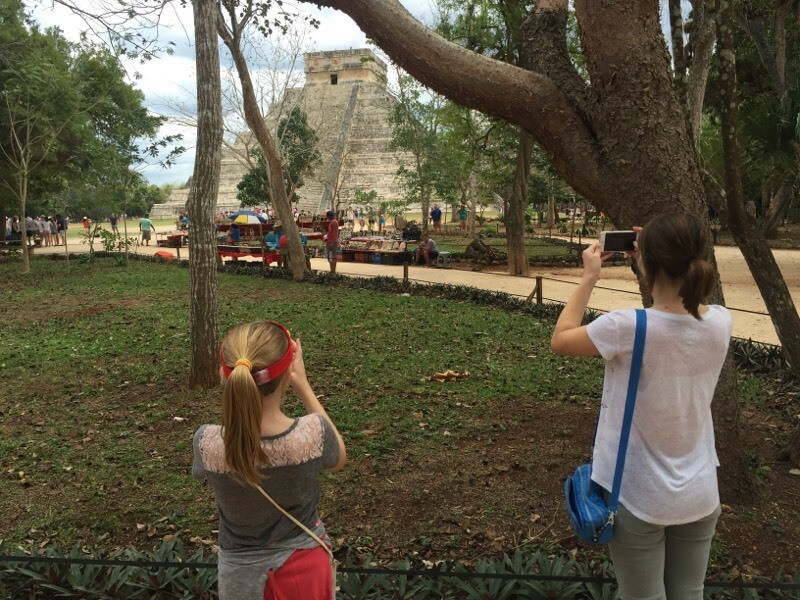 I noticed that there were not a lot of kids Zoe’s age at Chichen Itza so maybe Coba is better for younger kids. Sounds like a great day! I hadn’t realized only 8% was excavated as well, the place must be monstrous. I’m thinking more and more we need to put Mexico on our list.